Everyone worries or gets scared sometimes. But if you feel extremely worried or afraid much of the time, or if you repeatedly feel panicky, you may have an anxiety disorder. 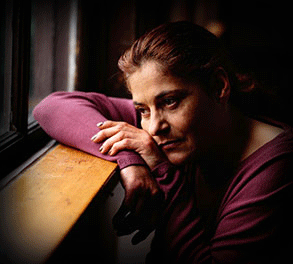 Anxiety disorders are among the most common mental illnesses, affecting roughly 40 million American adults each year. This Special Health Report, Anxiety and Stress Disorders, discusses the latest and most effective treatment approaches, including cognitive behavioral therapies, psychotherapy, and medications. A special section delves into alternative treatments for anxiety, such as relaxation techniques, mindfulness meditation, and biofeedback. Everyone worries or gets scared sometimes. But if you feel extremely worried or afraid much of the time, or if you repeatedly feel panicky, you may have an anxiety disorder. 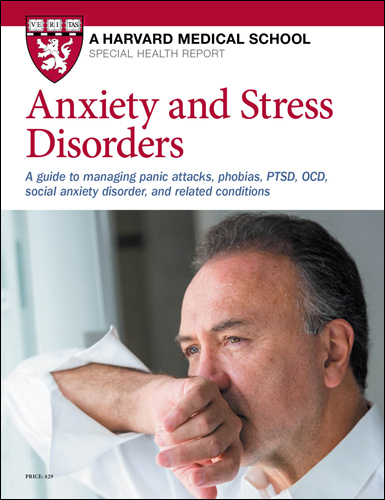 Anxiety disorders — which include panic attacks, post-traumatic stress disorder, and obsessive-compulsive disorder — are among the most common mental illnesses, affecting roughly 40 million American adults each year. Thankfully, there are numerous therapies to help control anxiety and stress disorders. This report provides up-to-date information on these treatments, including medications, exposure therapy, cognitive behavioral therapy, hypnosis, meditation, and exercise. It also includes information on the many types of anxiety and stress disorders, their symptoms, causes, and getting a proper diagnosis, as well as advice on making treatment work for you. Cognitive behavioral therapy (CBT), the leading form of therapy for anxiety, aims to correct ingrained patterns of negative thoughts and behaviors. As the name suggests, it has two parts. Cognitive therapy helps people change patterns of thinking that prevent them from overcoming their fears. Behavioral therapy works to change their reactions in situations that trigger anxiety. People with social phobia, for example, may assume that others will inevitably regard what they say as stupid. This is negative thinking. As a result, these people may avoid being with or talking to others. This is an example of negative behavior. The goal of CBT is to break this chain of thoughts and reactions. Because negative thoughts and behaviors tend to come to the fore when people are under stress, the first step in CBT is to help you recognize when you’re stressed. It’s important to have an inner “thermostat” that can tell you just how stressed you really are and how to dial it down. Research has shown that CBT is effective for panic disorder, generalized anxiety disorder, post-traumatic stress disorder, specific phobia, and social phobia. CBT can be done individually or in a group. If the anxiety is the result of a traumatic event that affected more than one person, group therapy may be most effective. CBT usually takes place weekly for several weeks or months; once your condition stabilizes, you may see the doctor once or twice a month or only if symptoms start to worsen. The therapist typically begins by asking you to record your thoughts and level of anxiety in certain situations. Then, you and the therapist discuss these thoughts, evaluate how realistic they are, and work together to substitute more productive thoughts. The therapist might also challenge you to consider what would happen if the fears came true, and whether that outcome would actually be so bad. The behavioral component of CBT incorporates two main strategies. The first, called exposure or desensitization, involves having people face their fears directly. This can be done in several ways. One is through role-playing. Another is by having a person imagine frightening situations and describe them. Yet another strategy is to give people “homework” in which they put themselves in real-life situations that spark anxiety. The reasoning is that avoiding anxiety-causing thoughts and situations reinforces fears or false beliefs. In real-life situations, people can practice recognizing negative thoughts and substituting more realistic ones. With repeated exposure, people eventually become desensitized to fear-provoking situations. The other main strategy is teaching people practical skills to help them feel more in control in difficult situations. For those who become extremely anxious when they have a lot to do, this may mean offering tips on setting goals and managing time. Those who are uneasy in social situations can be coached in conversational techniques and other social skills. No reviews have been left for this this report. Log in and leave a review of your own.